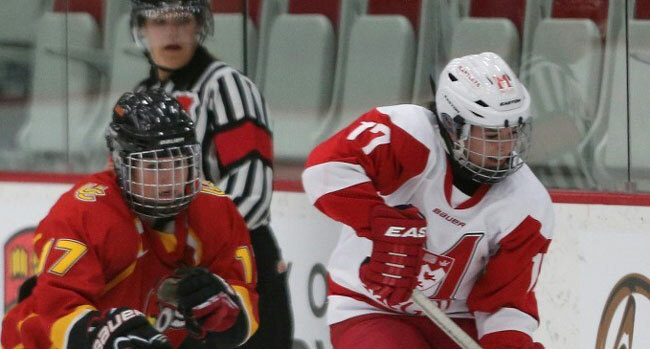 Mélodie Daoust, captain of the McGill Martlets, has been named by Hockey Canada to play at the 2016 Nations Cup tournament in Füssen, Germany, Jan. 4-7. The Canadian women's development team will participate in the four-day competition along with national teams from Finland, Germany, Russia, Sweden and Switzerland. Martlet captain Melodie Daoust is a Team Canada veteran, having first donned the Maple Leaf jersey in 2009. Mélodie Daoust, captain of the McGill Martlets, has been named by Hockey Canada to play at the 2016 Nations Cup tournament in Füssen, Germany, Jan. 4-7. The Canadian women’s development team will participate in the four-day competition along with national teams from Finland, Germany, Russia, Sweden and Switzerland. The 5-foot-6-centre from Valleyfield, Que., is one of three CIS players named to the roster – two of them from the Réseau du sport étudiant du Québec conference – along with forward Catherine Dubois of the Montreal Carabins and Katelyn Gosling, a defenceman with the Western Mustangs. The remainder of the roster includes 15 players from NCAA schools and four from the Canadian Women’s Hockey League. Daoust, who helped Canada capture gold at the 2014 Sochi Olympics, became the first player in CIS women’s hockey history to be named rookie of the year (2011-12) and player of the year (2012-13) in back-to-back campaigns. A two-time RSEQ conference all-star, she has twice earned CIS all-Canadian honours. 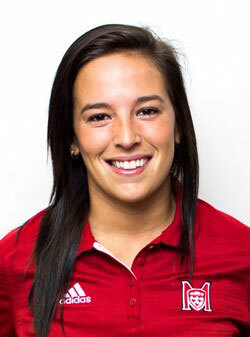 Also an Academic All-Canadian, Daoust has scored 78 goals and 184 points in 91 career games overall with the Martlets. This year, she leads the RSEQ scoring race with a 5-9-14 record in nine regular season contests. A 21-year-old physical education major, she has starred for Canada since making her debut with the maple leaf uniform in 2009 as a member of the silver medal-winning junior team at the IIHF under-18 world championship. In 2010, she scored the overtime winner in the gold-medal game of the IIHF under-18 world championship in Chicago. Daoust competed for the national senior team for the first time at the 2011 Four Nations Cup. In January, 2012, she helped the under-22 program triumph at the Meco Cup tournament in Germany. She attended the Canadian senior squad training camp in September 2012, and played at their Fall Festival tourney in Calgary. Daoust took a sabbatical from school in 2013-14 to concentrate on making the Olympic team and her dream came true at Sochi in 2014, where she scored one goal in Canada’s 3-1 semifinal victory over Switzerland, en route to the gold medal. Prior to its opening game on Jan. 4, against Sweden in Füssen, Canada will play three pre-tournament games in St. Pölten, Austria, facing Austria (Dec. 30), Hungary (Dec. 31) and the Czech Republic (Jan. 2). The Canucks open the tourney against Sweden on Jan. 4, followed the next day by a game against Russia.